Elisabeth Huber-Sannwald is Associate Professor (Titular C) in the Division of Environmental Sciences at IPICYT, in San Luis Potosi, Mexico since Fall 2001. In 1990, she received a Master¿s Degree, in Biology/Botany at the University of Innsbruck, where she collaborated with Dr. Georg Grahberr from the University of Vienna on the effects of land use change on biodiversity aspects, from the species to the landscape scale. In 1996, she received a PhD Degree, in Range Ecology at Utah State University under Dr. Martyn Caldwell. For her doctoral work she examined plant interactions between native and introduced grass species and plant functional groups (shrubs-grasses) in semi-arid shrub-grass communities of the Great Basin in the Intermountain West, U.S.A. 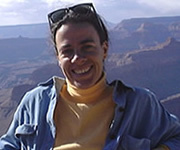 In 1997, she was Scientific Officer of Focus 4 on Global Change and Ecological Complexity of the Global Change and Terrestrial Ecosystems (GCTE) Core Project of the International Geosphere-Biosphere Program (IGBP) at the Instituto de Ecología de la Universidad de Buenos Aires, Buenos Aires, Argentina, where she collaborated with Dr. Osvaldo Sala. From 1998-2001, she was Assistant Professor at the Grassland Science Department of the Technische Universität München, Weihenstephan, Germany. She examined management effects on plant nitrogen and carbon allocation patterns and AM fungi distribution in different species-poor and species-rich grassland ecosystems. 1) Ecosystem response and feedback mechanisms to variable abiotic and biotic environments at different spatial and temporal scales in the semi-arid and arid region of Northern Mexico considering interactive effects of land use change, grassland biogeochemistry and the role of biological soil crusts in supplying fundamental ecosystem services.